YO HO HO and who won the Derby in 1937? HAVING reached 60 years, you would think they would know better, but Wesley Players are sharpening up their cutlasses, embroidering the eye patches, and getting ready to set sail for Shipwreck Island. The Upminster based most venerable group among local theatrical societies, is launching into the panto season with a play by Ken Holland, adapted by Natasha Blaauw, with four performances from Thursday January 23 to Saturday 25th, 2014, at the Wesley Hall, Upminster Methodist Church, Hall Lane, Upminster RM14 1AE. With a title of ‘Secret of Shipwreck Island’, the imagination can go into overdrive. Among the cast of castaways, is dashing hero Beau, a Demon King and Cannibals which we understand led to an interesting set of auditions. The group have put on over 170 productions since they were formed in 1949 , performing three a year including the ever popular pantomime. They meet every Monday at the Wesley Hall at 8pm and welcome any new members. Tickets are £7 for adults, with £5.50 concessions and £3.50 for children under 16. STRETCHING the concentration has long been one of the attractions of Ad Hoc Players, and they are carrying on the trend with a fund raising Quiz Night. 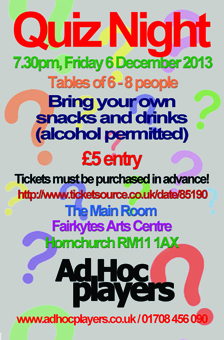 Brain power will be the order of the night as you can bring your own drinks and nibbles, for Friday December 6 night of whispers as tables of six to eight people fight it out for the title of Ad Hoc Brain. Tickets are £5 each for the event held in the Main Room at Fairkytes Arts Centre, Hornchurch RM11 1AX and must be purchased in advance from http://www.ticketsource.co.uk/date/85190. 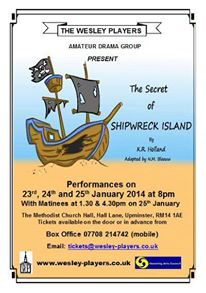 All proceeds go to support the society in the number of productions they put on each year. Formed in 1997 the group have encouraged members to get involved in all aspects of theatre, from performing to backstage work. Part of the attraction is the enthusiasm to enter festivals and perform a wide variety of material from new writing to old favourites.